Hydrogen induced cracking (HIC) damage is a degradation mechanism active in the oil and gas industry. The hydrogen atom is the smallest of all atoms and hydrogen attack is similarly insidious and hidden from simple inspection techniques. Hydrogen damage takes place at two temperature regions, elevated temperatures and temperatures at ambient and slightly above. The following details non destructive inspection techniques aimed at identifying, quantifying and tracking this form of damage. The operation consists of utilizing advanced ultrasonic techniques to detect HIC & SOHIC, metal loss and other laminar defects in the shell material of vessels. UT techniques include manual UT, TOFD, Phased Array Ultrasonics and Automated Combined UT (Triplex). Best results are obtained when a number of these techniques are employed together. 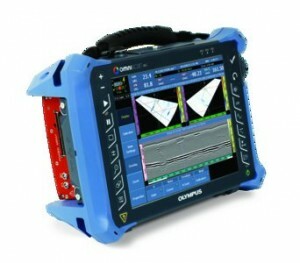 TOFD allows for fast screening of welds to determine the presence of HIC/SOHIC Automated Combined UT (Triplex) Shear & Longitudinal Inspection simultaneously to determine if stepwise cracking is present Phased Array is capable of verifying stepwise cracking and accurately sizing through-wall extent of damage. Experienced operators are able to quickly discern between dirty steel/inclusions and the presence of Hydrogen blistering which is early stage accumulation of Hydrogen atoms. Once observed these blisters should be monitored for growth and stepwise cracking to adjacent blisters to prevent failure of critical plant equipment. The use of automated robotic scanners greatly improves data acquisition and result in reducing overall costs for these inspections. Due to the high levels of repeatability of this technology it is possible to monitor degradation of material very precisely. The information recorded can be analysed to determine length and through wall height allowing for fitness for service calculations. As part of the effective inspection and FFS and RLA, it is essential that all parties involved have a common understanding of the terms and types of damage that may be encountered and will be discussed during the program, hence appropriate API 579 sections to be applied through the consultant follow up study. Laminations: A plane non-fusion, formed during steel manufacture, the defect is laminar in appearance and has a smooth ultrasonic profile. The indication will typically appear at a single depth over its length and breadth and exhibits no significant through-wall extent. A lamination typically results in little or no loss in back wall signal. Blisters: A planar cavity formed as a result of hydrogen charging. Typically the indication will show some variation in through-wall depth and does not display a smooth profile. There is normally a noticeable through-thickness extent- which may be confirmed by Time of Flight Diffraction (TOFD). Loss of back-wall signal is greater than that found with laminations. Length and/or breadth would typically exceed 25mm. Blisters are normally discovered near to process or outer surface of the plate and under some circumstances may be seen visually as a bulging of the plate surface. HIC: Planar cavity formed as a result of hydrogen charging. 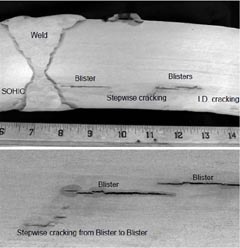 Individual cracks are generally quite small in area (length and/or breadth less than 25mm) and have no measurable through-thickness extent. HIC may be isolated (i.e. one by itself) or form clusters of cracks. Clustered HIC involves areas of individual HIC in close proximity to one another, both in terms of area and through-thickness extent, normally within 1 to 3mm. Note, although the cluster might show some through-thickness extent, the individual cracks in the cluster do not. For the purpose of this study, HIC does not exhibit through-thickness cracking. This feature is ascribed to SWC below. Evaluating what is the correct Advanced Ultrasonic Techniques for a specific task. Time Of Flight Diffraction (TOFD): This technique is very sensitive for detecting changes in material structure in a single line scan pattern and is ideal for fast screening of welds for the presence of environmental service related cracking such as HIC/SOHIC. This would then be followed up with alternative techniques for further evaluation. It is important that correct setups and procedures are used. e again correct setup, probe frequency and focus are paramount to accuracy of examination. Initial evaluation for determining the presence of HIC related damage can be obtained from 0° longitudinal scans of shell material, depending on the amount of energy loss at the back wall of material beneath inclusions; dirty steel; laminations or actual blisters. Classification of damage is performed as described in the attached Damage Rating Assessment Table. Severe damage will observe high accumulations of blister indications with a total loss of back wall beneath area of concern in comparison to dirty steel where there may be no notable loss of amplitude to back wall signal response. The preferred method for evaluation of stepwise cracking and SOHIC in HAZ region of welds is the utilization of shearwaves (45° or 60°) in custom made transducers known as Triplex probes. These assisted with Automated Imaging systems allow for comprehensive evaluation by volumetric projection techniques. Analysis of data is typically performed shortly after first inspection sequences have been completed, this allows the AUT specialist to determine if the need exists to perform additional higher resolution scans or expand upon the extent of scan areas. This system reduces costs and time spent evaluating equipment as AUT team are already setup and have all required permits. Obviously it is not always possible to follow this system due to other conflicts or schedules.